The OMEGA™ iSeries is a family of microprocessor-based instruments offered in three true DIN sizes with NEMA 4 (IP65) rated front bezels. All of the instruments share the same set-up and configuration menu and method of operation, a tremendous time saver for integration of a large system. The iSeries family includes extremely accurate digital panel meters "DPi" and single loop PID controllers "CNi" that are simple to configure and use, while providing tremendous versatility and a wealth of powerful features. The CNi Series covers a broad selection of transducer and transmitter inputs with 2 input models. The universal temperature and process instrument (CNi models) handles 10 common types of thermocouples, multiple RTDs and several process (DC) voltage and current ranges. This model also features built-in excitation, 24 Vdc @ 25 mA. With its wide choice of signal inputs, this model is an excellent choice for measuring or controlling temperature with a thermocouple, RTD, or 4 to 20 mA transmitter. The strain and process instruments (CNiS models) measure inputs from load cells, pressure transducers, and most any strain gage sensor as well as process voltage and current ranges. The CNiS has built-in 5 or 10 Vdc excitation for bridge transducers, 5 Vdc @ 40 mA or 10 Vdc @ 60 mA (any excitation voltage between 5 and 24 Vdc is available by special order). This CNiS model supports 4- and 6-wire bridge communications, ratiometric measurements. The CNiS features fast and easy "in process" calibration/ scaling of the signal inputs to any engineering units. This model also features 10-point linearization which allows the user to linearize the signal input from extremely nonlinear transducers of all kinds. The iSeries are 1/8, 1/16 and 1/32 DIN controllers featuring the big iSeries color-changing display. The digits are twice the size of typical 1/8 DIN panel meters. 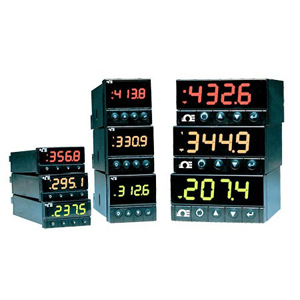 The iSeries meters feature the only LED displays that can be programmed to change color between GREEN, AMBER, and RED. Featuring optional "embedded Internet" (specify "-EIT" option) the iSeries are the first instruments of their kind that connect directly to an Ethernet network and transmit data in standard TCP/ IP packets, or even serve Web pages over a LAN or the Internet. The iSeries are also available with serial communications. With the "-C24" option, the user can select from the pushbutton menu between RS232, RS422, and RS485, with straightforward ASCII commands. If Modbus is required, we recommend our latest Platinum controllers - CNPT Series. * No CE compliance above 60 Hz. ** Units can be powered safely with 24 Vac power, but no certification for CE/UL are claimed. Note: Refer to the Related Links for CNi32, CNi16 and CNi8 for complete specifications. 1. Ethernet options are not available for the CNi8A, CNi8C, CNi16, CNi16A or CNi32 controller. 2. "-DC", "-C24", and "-C4EIT" not available with excitation. 3. Analog output is not available with "-AL" units. 4. CNi8A0x-AL or CNi16A0x-AL contains 1 alarm and 1 analog retransmission. 5. "-SM" option not available on CNiS strain models.